Bento is the Japanese equivalent to the American bagged lunch, but it’s also an art form in itself, and is strongly integrated into Japanese culture. Bento is a lunch turned into a scene or portrait, all within the confines of a small box, and created out of edible materials. 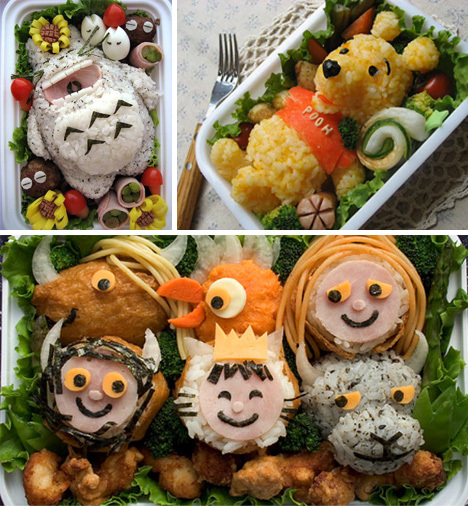 Oekakiben is a style of bento called picture bento, that involves creating a scene or depicting animals out of the meal. Above, we see three little pigs, a frog, and an incredibly detailed depiction of Canadian geese. 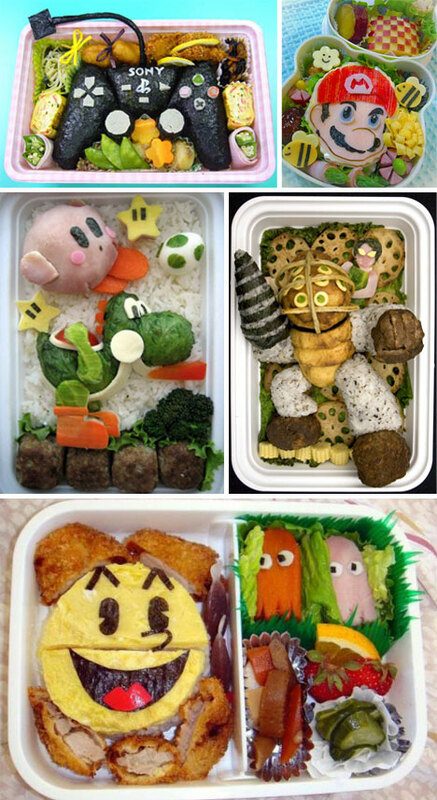 Kyaraben bento typically refers to bento that depicts characters from popular cartoons, films, or video games. The images above are all from video games, including a Playstation controller, a portrait of Mario, the Big Daddy character from the Bioshock series, Pac Man ghosts, and even Pac Man himself! The collection is rounded out with Yoshi and Kirby. Star Wars has fans across the globe, and thankfully some fans spent the time to create these beautiful depictions of scenes and characters from the films. A Jawa with Tattooine’s twin suns framed in the background, is followed by a TIE fighter and an Imperial Stormtrooper (with the Death Star over his shoulder). A surprisingly accurate noodle Chewbacca gives the Rebellion an appearance. These characters come from children’s books and movies. 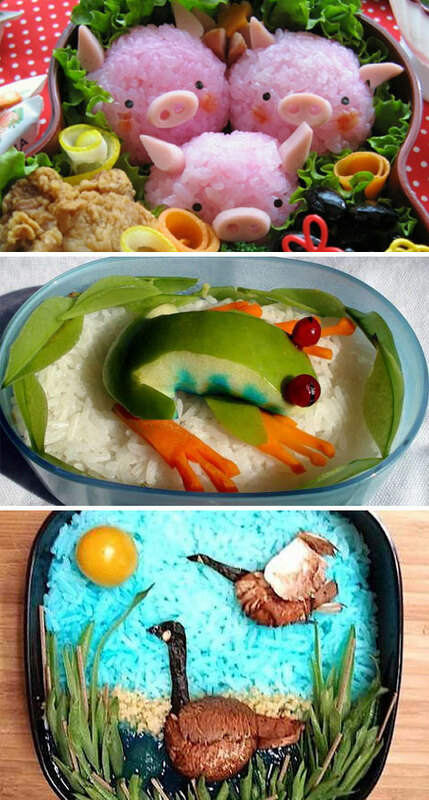 It’s amazing how much one can accomplish with a bit of rice and carefully placed edible odds and ends. A giant Totoro from Hayao Miyazaki’s film My Neighbor Totoro and Pooh bear from the best selling children’s book series (and television, and film) are alongside the monstrous characters found in Where the Wild Things Are. 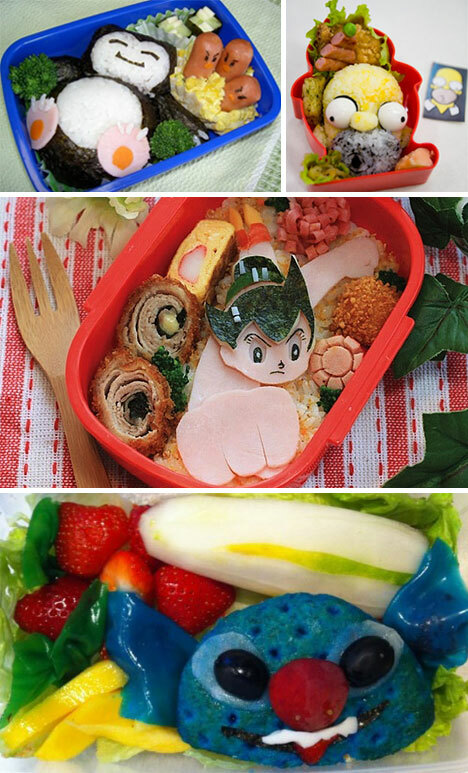 A lot of bento is made for children’s lunches at school, so their is a natural trend towards anime and cartoon characters. This series depicts a Pokemon character, the world-famous Homer Simpson, Astro Boy, and Stitch, from the popular kids’ movie, Lilo and Stitch. 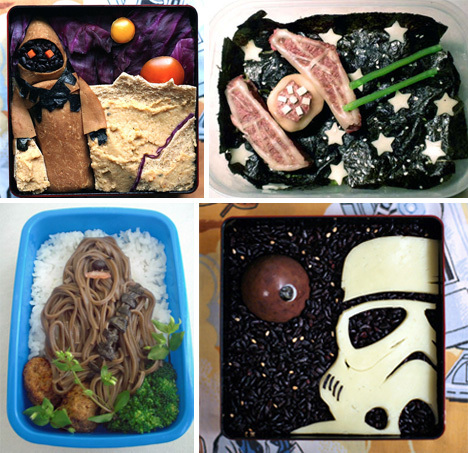 There are bento competitions where people attempt to create the most aesthetically pleasing (or creative) bento boxes. 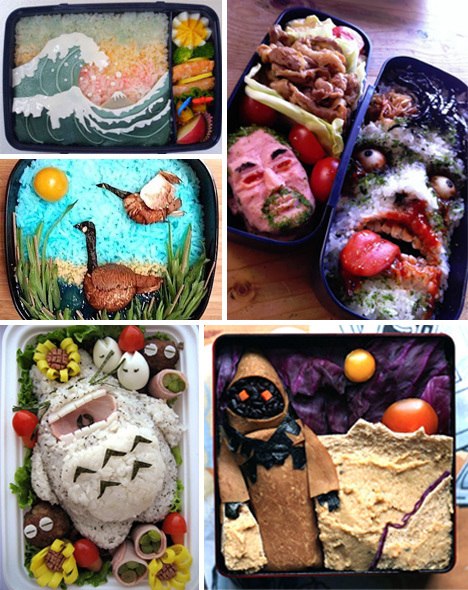 These amazingly detailed bento would likely win any prize. 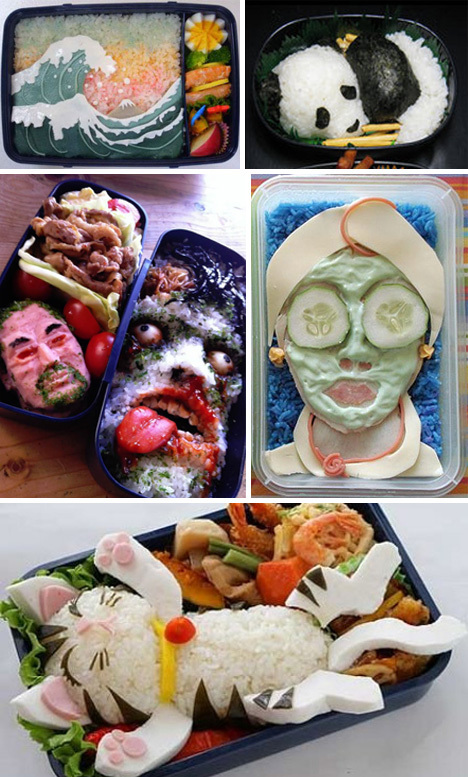 While these particular bento share a high skill level, they vary wildly in their subject matter: a famous Japanese painting is reproduced in stunning detail, a panda is depicted curled up in the box, and a woman spends her day at a spa. A fully realized cat lies on its back, ready to play, while the much less cute portraits of a man and a zombie fill their own boxes.